The annual event welcomes young children from the neighborhoods to campus to trick-or-treat in a safe environment. 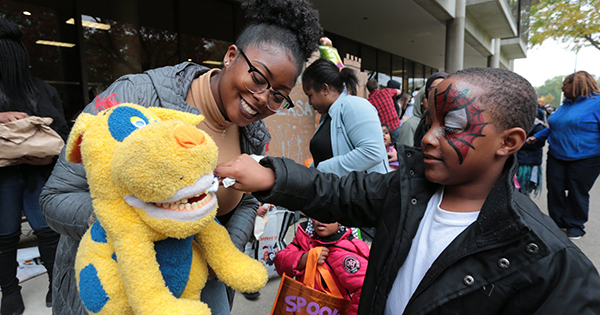 More than 1,765 pounds of candy was donated by Detroit Mercy student organizations, faculty, staff and administrators and was distributed by fraternities, sororities and student organizations from decorated booths on the McNichols Campus. Detroit Mercy students gave out health and wellness tips with the candy. Enjoy the photos of this annual favorite that was held Oct. 26 this year.